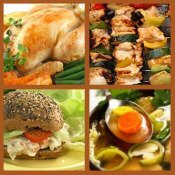 Find Free Chicken Recipes perfect for you, from the gourmet chef to the low fat guru, or a busy mom. Chicken lends itself to many different cooking styles and meal ideas. From crock pot, to casserole, salad, soup, roast, baked, barbecue, curry, fried.... the list goes on. "Endless flavour combinations with fabulous Chicken Recipes"
Whether it's a quick dinner recipe to be ready in a flash, tasty bites, gourmet cuisine or just a lazy summer lunch idea, I have the best recipe for every ocassion. Maybe you're just looking for a delicious recipe for chicken breast or a recipe for chicken noodle soup. "Be Inspired To Cook Delicious Chicken With These Mouthwatering Recipes"
I am a work-at-home-mom, now fondly referred to as WAHM. I have always had a love for cooking but as I progressed to wife and then mom, I have found that chicken has become a more common ingredient to my recipes. It's versatility and vast range of easy recipe ideas make it a great companion to the busy mom. Over the years I have collected a great number of chicken recipes from quick and easy to a little more expertise required. I hope to share them all here with you (for free of course). My homemade recipes range from old favourites like roast chicken, quick-and-easy recipes needing minimal effort or time and a sprinkling of those that need a bit of extra gourmet knowledge and experience. From a quick stir-fry or barbecue to a roast chicken dinner or tasty pie, chicken can be served in a great variety of ways. Be pleasantly surprised as you meander through my mouth-watering chicken recipes. There are lots of chicken dinner recipe ideas. While you are searching for your Chicken Marsala Recipe, another easy dish to cook like Chicken Tortilla Soup Recipe may just tantalize your taste buds. If you're a bit more adventurous then a boneless chicken breast recipe like Ricotta and Pesto Stuffed Chicken Breast Recipe Wrapped in Bacon will have your friends thinking you've been on a gourmet cooking course. You might love to receive our personal newsletter called Cooked Up. It's packed with great recipes, updates to this site, general cooking tips and other interesting cooking news. I invite you to safely subscribe in the form on the top right corner..... Oh and of course it's free!